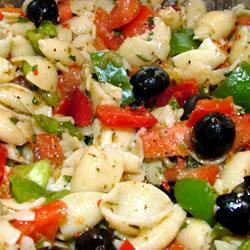 This could be called Pasta Salad for those Who Don’t like Pasta Salad. People who don’t ordinarily like pasta salad go crazy for this one. How popular is it? People love it so much they eat the leftovers as a snack. One woman said she had complete strangers come up to her and ask for the recipe! Now that’s a recipe! Not surprising that it’s the #1 pasta salad recipe at AllRecipes. This salad has so many wonderful ingredients including asiago cheese, green and red peppers, black olives, tomatoes, salami, and pepperoni. You can use any shape of pasta you like, but I like penne pasta that is cooked to just “al dente,” or just barely tender. Add a teaspoon of salt to the water you boil the pasta in. The recipe is called Antipasto Pasta Salad which I think is funny. An antipasto plate never has pasta on it. That’s what anitpasto means: against pasta! So this is like a plate of good antipasto with lots of full-flavored ingredients. Then you add pasta to it! It’s not like some pasta salads that are mostly pasta. One reviewer added more tomatoes. Feel free to increase any ingredients that you like. Since you are not using mayonnaise or a mayonnaise-based dressing, it is safer to take to picnics, potlucks, and to leave it setting out a little longer than a salad with a creamy dressing. Food poisoning is a danger more often with mayo-based dressings.